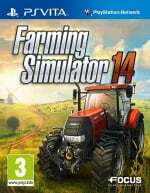 "It fields good to be back"
Good news agricultural aficionados: Farming Simulator 14 is set to plant a place on your PlayStation Vita this June. Having spotted the handheld release on various retailer websites, we reached out to Giants Software in order to learn a little more about the latest entry in its soil obsessed series. 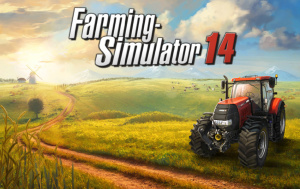 Unlike the franchise’s previous handheld foray, it appears that this edition will receive a physical package – but it will still be based upon this year’s iOS and Android outings. Improvements to the mobile mini-adventure include a multiplayer mode and the introduction of animals, but the developer ensures us that there’ll be even more to do on Sony’s pocketable platform. Company spokesperson Marc Schwegler also told us to expect improved visuals. Still, with the title currently carrying a £26.86 ($44) price point on some sites, those enhancements are going to need to be huge in order to justify the price hike over its £2.20 ($3) companion. Are you champing at the bit for more cultivation escapades? Do you think that the developer may slip on some unsavoury substances if it sticks with the sequel's steep asking price? Moo at us in the comments section below. @eliotgballade Agreed, this series really sets the wheat from the chaff. The last game I enjoyed that was anything like this or what I assume this to be; was railroad tycoon, loved it despite the fact it was glitch central. This is @get2sammyb's favourite game barn-none! We'll officially be losing him to it this June. @divinelite It's the iOS version, so sadly it won't be.